The VERION™ Digital Marker displays patient information and images from the VERION™ Reference Unit. The VERION™ Digital Marker can be used with the LenSx® Laser, CENTURION® Vision System and the LuxOR™ LX3 Ophthalmic Microscope as well as most other ophthalmic microscopes. 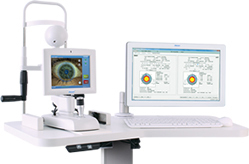 The VERION™ Image Guided System is an entirely new way of looking at cataract refractive surgery. Instead of checking for refractive error at the end of your procedure, the VERION™ Image Guided System helps minimize potential sources of error during each step of the surgical process. From patient imaging to surgical planning to procedural guidance, the VERION™ Image Guided System is designed to help you consistently hit your cataract refractive target. With more and more cataract patients asking for better vision, reducing your refractive error has never been more important. Unfortunately, with today’s cataract refractive surgical procedure, there are multiple sources of potential error that are inherent to the status quo process. While each of these instances may only yield a tiny amount of error, they can add up to a significantly impacted refractive outcome because there are so many of them.